^ Edward Belbruno, J. Richard Gott III (2004年). “Where Did The Moon Come From?”. arXiv:astro-ph/0405372. Eric B. Ford and Matthew J. Holman (2007). “Using Transit Timing Observations to Search for Trojans of Transiting Extrasolar Planets”. 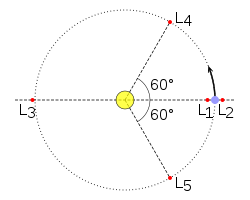 The Astrophysical Journal Letters 664 (1): L51–L54. doi:10.1086/520579. http://www.iop.org/EJ/article/0004-637X/571/1/528/55113.html.